Kolkata - Sri Lanka paceman Suranga Lakmal jolted India with three wickets, including skipper Virat Kohli, to leave them reeling at 17-3 on a rain-hit opening day of the first Test on Thursday. Lakmal claimed Lokesh Rahul with the first ball of the match at Kolkata's Eden Gardens and bowled six overs without conceding a run. Put in after a long rain delay that washed away the first session, India batted for only 11.5 overs before bad light ended the day. Cheteshwar Punajara, on eight, and Ajinkya Rahane, yet to open his account, were at the crease after India suffered early blows on a green wicket that offered bounce to the seamers. Rahul edged a rising delivery from Lakmal to wicketkeeper Niroshan Dickwella before the crowd had even settled. The paceman then took Shikhar Dhawan for eight, after the left-hander dragged a moving delivery on to his stumps. That left the hosts on 13-2. 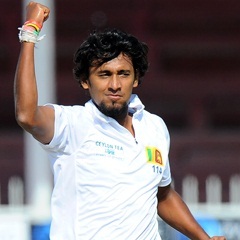 Sri Lankan fast bowling coach Rumesh Ratnayake lauded Lakmal's efforts on a pitch he said was a "nightmare" for the batsmen. "I am not sure if it's the best spell I have seen but (it is) one of the finest I have seen for a long, long time," Ratnayake told reporters. "Saying that the wicket was very receptive, it was very helpful and it's going to be a big challenge... But the job isn't finished. It has only started." "I believe it's a 50-50 chance for both teams and if that's the option one wants to take as a fast bowler, as a fast bowling coach, I would like to play on wickets like this. But it might be a nightmare for the batsmen," the former paceman added. Pujara, who was beaten by the moving ball on a few occasions, and Kohli tried to establish themselves before bad light forced the umpires to call an early tea. The break did India no good as Lakmal returned to trap Kohli lbw for an 11-ball zero. Kohli, in a desperate bid to avoid a rare duck in his glowing career, reviewed the dismissal but replays suggested the ball would have clipped his leg stump. Soon Pujara, who played 43 of the 71 balls bowled in the day, and Rahane complained of low visibility against the seamers and the umpires halted play for the day. India's assistant coach Sanjay Bangar said the world's number-one team was keen to challenge itself in every condition possible. "We are happy to play on wickets like this. A team doesn't really want to play on easy conditions," Bangar said. "We challenge ourselves and most players are open to such challenges. We want to continue improving as a team," the former batsman said. Sri Lanka, who lost three Tests, five one-day internationals and a Twenty20 international in a home series against India from July to September, are searching for their first Test win in India.